Today, we are covering what I regard as one of the very most important subjects that is out there. It has nothing to do with marketing but it has to do with mindset. 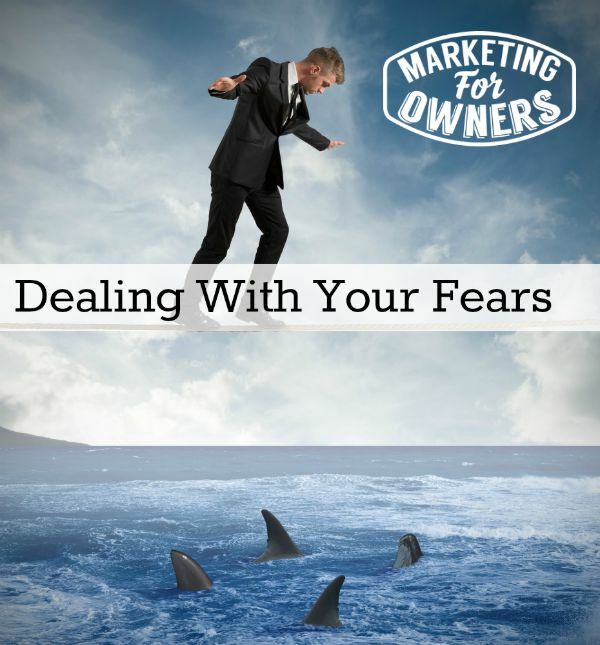 Today we are talking about conquering fear. Now, lots and lots of people I know have fears. We all do and me included. Anything that takes us outside of our comfort zone can cause fear. This includes everything but I’m just going to talk around business scenarios, okay? So, anything that takes us outside of our comfort zone is scary for many reasons. Now, what kind of fears can we have? We can deal with fear of not being good enough, not being ready and not being an expert. It comes to not being good enough. I’m not an expert. How can I teach anybody about marketing? As not being as good as so and so person, not earning enough, not earning as much as everyone else I know. The fear of failure, the shame, the fear of the shame that will come with failure. These are all very valid fears. There are loads more that I could list as long as my arm, but these are the most common fears and they’re very real. They lead to inaction and they lead to procrastination. These are not life or death. These are not suicidal fears. This is not that kind of fear, but these are fears that genuinely hold you back or your business back if it’s what is going on. What he’s saying is it all comes down to you. It’s in your head. You know this but again, it’s still not easy. So, let me give you some pointers as to how to conquer your fears, how to deal with them and yes, I understand. This is not easy. So, remember, baby steps. First of all, you need to get clear in your mind what it is that you’re actually afraid of. It’s not necessarily going to be one thing or it may be all of them. I recommend listing it out on paper. Write down your fears. What are you afraid of? You don’t have to show this to anybody. Once you’ve written them down, you can go and burn the piece of paper. Put it through the shredder. Rip it up into tiny bits or you could put it at the bottom of a drawer, in a folder. Put a date on it and come back to it in six months time or in twelve months time or five years time and remind yourself how far you’ve come when you’ve dealt with what you’re used to be scared of because you’re going to get over this. All those conversations, all of them — write them down. Now, these are fears. So, don’t misinterpret things like that for not being fears. Write them down. Once you’ve written each one down online, what I’d like you to do is try and step outside yourself and imagine talking to somebody who doesn’t suffer from this. But write down what they would say to you if you told them this. Again, you don’t have to say it to anyone. You can do this in the privacy of your own life. Keep this all to yourself, okay, if you have to. But write down what you think someone else would say to you if you said that to them, okay. Then, think what’s the worst that can happen? Now, for instance, I just said, you decided to make a course. You do it. You put it up for sale and no one buys it. Now, what I want you to do though is that as you are thinking what’s the worst that can happen, I want you to exaggerate the worse. I want you to exaggerate it to be as worse as it could possibly be like ten times worse to the nth degree, the absolute tragic ultimate. Yes, you see where I’m going with this, don’t you? There’s a lot of writing down, but this exercise, you’ve probably never gone through this before. This is self-help and self-improvement. No I don’t do self-help or self-improvement. No, I’m not a guru. But honestly, just follow me with this. Now, when you exaggerate these things, what you do is you’ll start to see how your fears, how they compare with the real world. Once you write down, once you imagine what’s the worst and, then exaggerate it, then you realize what the real world is like. You’ll start to see okay, maybe, I just built that up in my mind. The next one, imagine yourself being afraid but dealing with the situation in hand. So, pick one of those. Go back to that one. Okay, I’ve created this course. I’ve put it up for sale. I’ve put myself out there. I’ve told my friends. I’ve told everybody and nobody bought it. How would you deal with that? What would you do next? So, think to yourself, what will you actually do? There are loads of quotes that explain that nobody ever got anywhere unless they conquered their fears or let’s say tried to fail etc. Next one, do a little of the thing you fear. You don’t have to do a lot — just a little bit. Once you’ve done it, do it again. Once you’ve done it again, do it again, baby steps in tiny portions. Then, do it again. Then, step it up a bit. Do it a bit more. Do it a bit more. Step it up. Do it, do it again. You will start to find it’s not as bad as perhaps you thought but remember, baby steps, very important, okay? Now, I don’t suggest you get any SAS but it does apply to a lot. Who dares wins? So, try it, just try. Imagine all these little things, add up. They’re going to help. Finally, try and talk to someone you trust. Now, that doesn’t mean that you have to go at like an alcoholic’s anonymous meeting in front of people, in public, on video or anything. Find someone you trust. Talk to them and see if they can help. You want to make sure to find someone that you trust what they’re going to say, and someone you feel comfortable with. You don’t want somebody that’s going to put you down, and will say things like — “What’s the matter with you?” So, this is all good. I recommend you try that if you have a friend who also suffers from this kind of thing if you don’t suffer from it yourself. Ask them to come and have a look at this podcast, to look at the video or listen to it in iTunes or whatever. In fact, they can just go on the website and the mp3 to listen to this day. You can download. It’s a Thursday and it’s time for a drive time podcast. 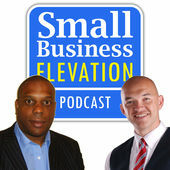 Now, today, I’m going to recommend the Small Business Elevation podcast. Now, I’ve listened to a few of these and it’s with a couple of brummies from the U.K. They have funny accents. I actually grew up there but they’re great fun. Rob Smith and Leon Streete make up Small Business Elevation. So, go to iTunes and look it up. You’ll come across them. Mark has shared with speaking and everything but a fantastic conversation they have between the three of them. I learned a lot and I had to stop it, rewind, go back and get a pen and paper and start writing those great tips they shared. The two guys interviewed were making notes and coming back and explaining it. The guy, Rob, who is very funny, sounds great. He kept on interrupting him and putting his point in a very funny fashion. It’s just infectious, that’s the funny thing. Go listen to them. I found them sort of infectious. I loved it but I was amazed how knowledgeable they were. It was great. I learned a ton of things about putting on an event. You might want to listen to the interview of Chris Marr because he talks about how he puts on an event, a conference and how to make it successful, that was an eye opener in itself. But anyway, listen to the podcast and subscribe. If you want to know how to score a free book from my recommended books list, go to my marketingforowners,com/freebook. If you go there, you’ll find out what would happen if you subscribe and give a review for my lovely podcast. It’s a special for you. It’s simple, full instructions on that page. Go and reward yourself today. I’ll catch you tomorrow with a weekend challenge. What fears do you have going on?